These are simply realistic cat ears without the fluffs we usually have in the front..just on the bottom. :) Inside is black velvet. I love my ears so much! Its hard to find ears in this colour so I'm so happy with them! 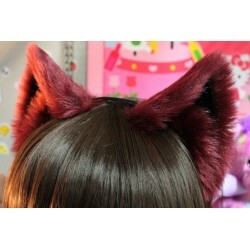 The color is a bit darker than I expected looking at the picture, but I love these ears! I was surprised how they were made, but these are really good quality and I will be sure to wear them a lot!